Royal Navy destroyer HMS Diamond has begun operations in the Arabian Gulf in support of UK interests in the region. The warship is on a routine deployment to the Middle East, having relieved her sister-ship, HMS Daring, earlier in the month and will operate in the area until late 2012. The Ship’s Company has had a busy start since arriving. 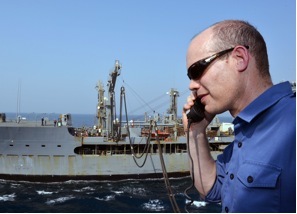 Whilst on passage the Royal Navy Liaison Officer to Oman, Captain Richard Ingram Royal Navy, took the opportunity to visit Diamond as she sailed across the Arabian Sea and he emphasised the important role that the Royal Navy has in reassuring regional allies of our commitment to the area. Diamond has joined four UK Mine Counter Measure Vessels (MCMVs) HM Ships Shoreham, Ramsey, Quorn and Atherstone, who are based in the Gulf for warm water training. She has also worked with support vessels such as the Royal Fleet Auxiliary Cardigan Bay and ships from other nations who are currently combining to provide better regional maritime security. 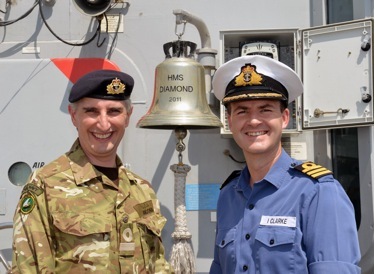 Diamond‘s most recent port visit was to Bahrain, where the ship hosted members of Combined Maritime Forces (CMF) as well as the United Kingdom Maritime Component Commander (UKMCC). CMF oversees the activities of Diamond and directs the work of 3 distinct task forces. These operate from the head of the Arabian Gulf in the North to the Red Sea in the west, the shores of India and Pakistan in the east and the Seychelles in the south – an area of some 2.5 million square miles (6.5 million square kilometres). The ships allocated to these three task forces – 150 (counter-terrorism/maritime security), 151 (counter-piracy), and 152 (maritime security in the Gulf) – are drawn from 26 nations across the world.